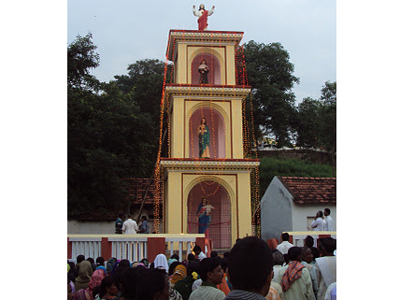 The diocese of Srikakulam was erected in 1993 carving it from the civil district of Srikakulam and the Taluks of Kurupam, parvathipuram, Cheepurupalli and Gummalakshmipuram of Vizianagaram District. The geographical area of the diocese is 8,542 square kilometers. It was bifurcated from the erstwhile diocese of Visakhapatnam and erected a separate diocese on the August 4, 1993, with Most Rev. A. Innayya as the first bishop of Srikakulam. The diocese was started with 35,000 Catholics, 14 parishes, and few resources for caring to the spiritual, pastoral, social, economical and educational development of the vast population of the area. With the strenuous efforts and zeal of Bishop, priests and religious the task of building up of the Church in Srikakulam diocese has been speeded up still more and today it has more than 50,000 Catholics, 22 parishes, 32 priests, 75 sisters and 154 catechists. The geographical area of the diocese could broadly be divided into two regions like the coastal belt and upland region. The people living in these regions are predominantly the agricultural labourers as agriculture is the main occupation. The people living in the plain and upland region do have the advantage occupations like working in the forest, collecting the products from the forest like gum, fire wood, timber, honey, tamarind etc. and vending the same to the people of the plain areas either in exchange of the other commodities or for cash. The Srikakulam district is the second largest one in the state of Andhra Pradesh having the highest concentration of the Scheduled Tribes living across the Western Ghats, either at the foot or the top hills. The tribes like Savaras, Jatapus, Gadabas and Kons are widely seen in this forest area. They make their lives mostly depending upon the forest while some cultivation their pretty extent of lands. The people living in plain areas of Srikakulam and parts of Viziangaram are the agricultural labourers. In almost all the villages majority of the population are scheduled castes. There are also some people who do possess some extent of lands ranging from 0.50 to 2.50 acres. Since the income derived form these lands is not adequate to supplement the maintenance of their families, they are forced to work in the fields of the rich of the area as agricultural labourers. In any case the daily income of a poor family does not exceed Rs. 35 to 40/-. In most of the family one can see that the children also go for work just to supplement the income of their parents. Hence the literacy percentage in the diocese is very low. The diocese with its limited resources trying to raise this literacy percentage among the Catholics with whom the priests and nuns have free access. Even for the pastoral activities in the parish level, the people are not in position to contribute much to the church; just because of their poverty. Seeing their condition the Church also does never force the people to pay for the celebrations or functions. At this juncture the diocese with its limited available resources is managing most of the functions or celebrations in the parish/deanery/diocesan level.